The peripherally inserted central catheter (PICC) is used as a long-term vascular access to deliver medications and venous nutrition. The PICC tip terminates close to the heart or in one of the great vessels—the superior vena cava or the inferior vena cava. Catheter tip confirmation is usually achieved by plain radiography. 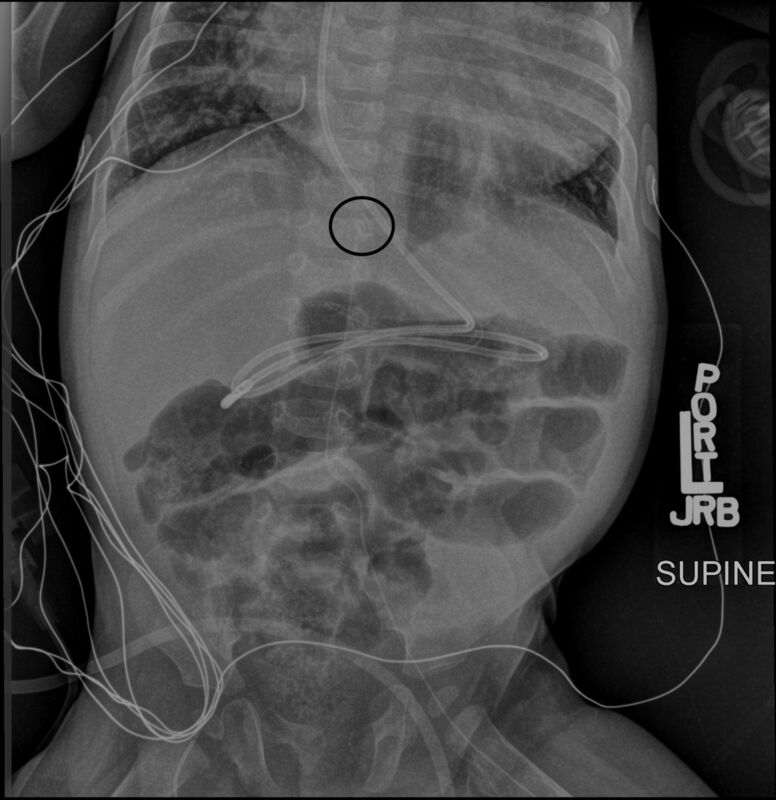 We describe a case of a 9-month-old boy with complex congenital heart disease (heterotaxy syndrome, polysplenia type) who underwent pulmonary artery banding to reduce pulmonary blood flow to control heart failure symptoms. PICC was placed in the left femoral vein during the postoperative period. 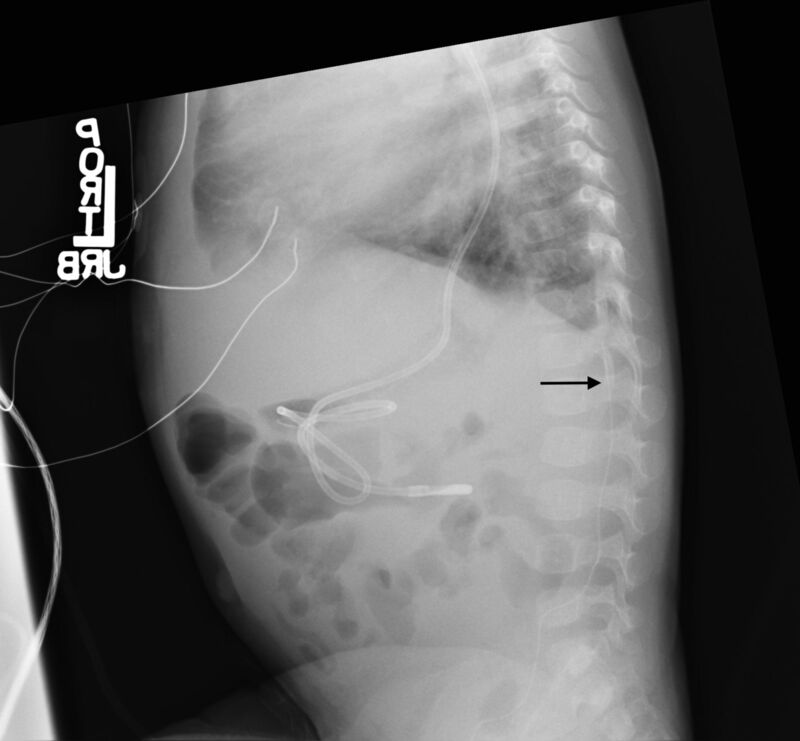 PICC tip confirmation was obtained by anteroposterior plain abdominal radiograph (figure 1), which demonstrated catheter tip bending at T12. The lateral radiograph of the abdomen showed that the PICC courses posteriorly into the lumbar venous plexus (figure 2). The ascending lumbar veins arises at L5–S1 from the common iliac vein and drains into the epidural venous plexus. Inadvertent placement of the PICC in the lumbar veins may lead to a multitude of complications, including perforation of the venous system leading to extravasation of fluids into the spinal canal,1 air in the spinal canal leading to temporary paraplegia,2 and permanent neurological damage in the form of neurogenic bladder or flaccid paraplegia.3 The presentation of aberrant PICC placement varied and can be delayed for several days.2 The lateral plain abdominal radiograph may be considered for additional confirmation when the PICC tip lies in the inferior vena cava but does not advance to T8–T10, or takes an unexpected course (bends, curls). Abdominal X-ray anteroposterior view. The left femoral vein peripherally inserted catheter appears to be in central circulation. The black circle shows the catheter tip bending at the level of T12. Abdominal X-ray lateral view. The black arrow shows the peripherally inserted central catheter courses posteriorly into the lumbar venous plexus and terminates at the level of T12. Peripherally inserted central catheter (PICC) tip confirmation is usually achieved by plain radiography. The presentation of aberrant PICC placement is varied and diagnosis can be delayed by several days. The inadvertent PICC placement in the lumbar veins may result in temporary (fluid/air in spinal canal) or permanent complications (neurogenic bladder or flaccid paraplegia). The lateral plain abdominal radiograph may be considered for additional confirmation when the PICC tip lies in the inferior vena cava but does not advance to T8–T10, or takes an unexpected course (bends, curls). Contributors AB: literature search, figures, data collection, analysis, data interpretation, writing. KB: figures, data collection, analysis, data interpretation. VA: data collection, analysis, data interpretation, writing.